COLUMBIA, Md. - It seemed like the perfect patch, Susan LeClair thought, about her sister and her sister's brand new pit bull. 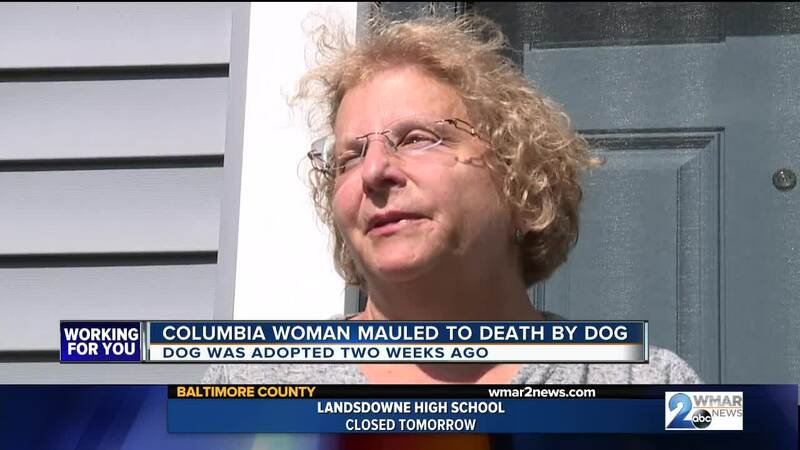 LeClair's sister Robin Conway, 64, decided to foster the dog only two weeks ago. "(She) loved animals, all kinds of animals. I was the one that wimped out and said wee. She was the one who said,'oh I'll take the fish of the hook," LeClair said. Conway took her new pit bull out for a routine walk Monday evening. But as the sun started to go down and Conway didn't return, her husband looked out back. "She was in love with that dog. And she is in love with animals -- Conway. The dog, apparently, went after her," LeClair paused. "She was dead." Howard County Police say the pit bull was standing over Conway's body -- the family, acting quickly, tied it to the backyard fence. "Even it's behavior at the scene after our first responders got there -- the dog was on a leash, but lunging and barking. They tried to subdue him and ultimately had to euthanize him," Sherry Llewellyn, a spokeswoman with the police department, said. Animal Control deemed the dog a danger to those around it both animals and, in this case, humans; it had to be put down. A grim conclusion to a budding relationship between Conway and her new dog. "They have been lovely, lovely dogs. It was obviously something wrong with this dog, but that's not to be construed as all pit bulls are bad and I know Robin wouldn't want that," LeClair said. A necropsy will be done to see if the dog had rabies or any other medical issues. No other incidents were reported involving this dog and police say they do not have any information about the dog's adoption, other than it was out-of-state. Police are conducting a standard death investigation and awaiting autopsy results to confirm the cause of Conway’s death.